January. It’s a terrible time for baseball fans because we’re a whole month away from just the tiny buds of Spring Training, and more than two months out from the first real pitch of the season. But I’m looking forward to the sunny morning skies of late February in Jupiter, Florida when the 2014 Marlins take the field together for the first time. 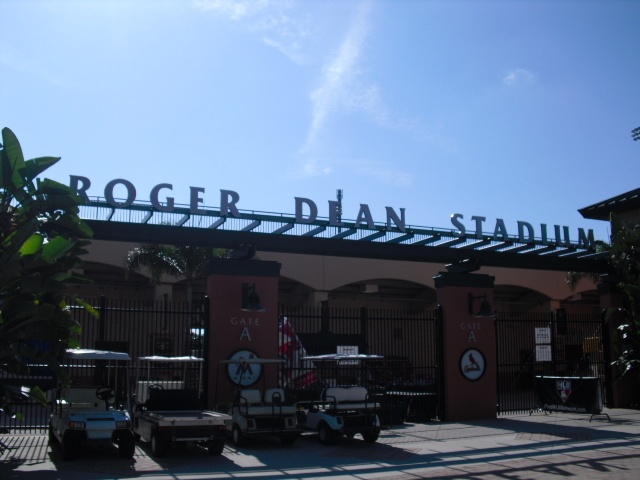 Most baseball fans dream of watching their team in the warm, relaxed atmosphere of Spring Training, so for anyone considering trekking down to Roger Dean Stadium this year, here’s your definitive guide. 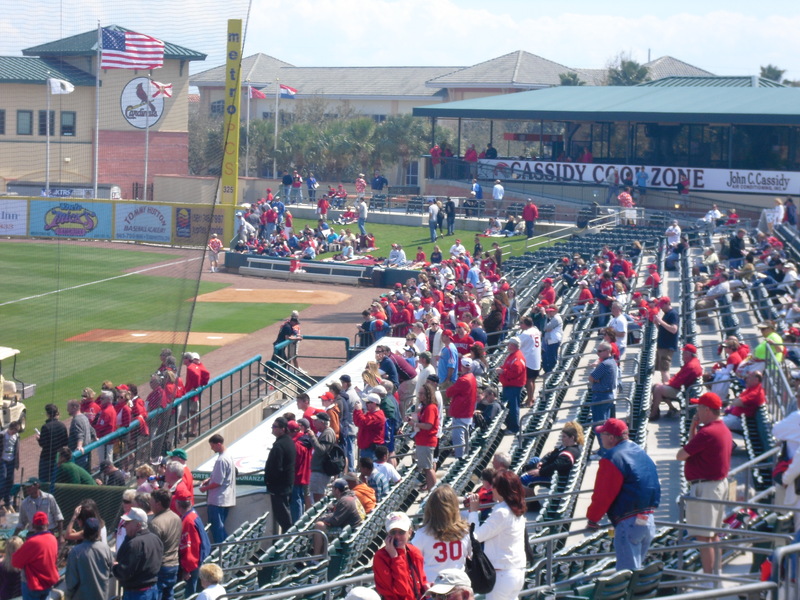 Opened in 1998, Roger Dean Stadium hosts Jupiter Hammerheads and Palm Beach Cardinals in Class-A Minor League Baseball. 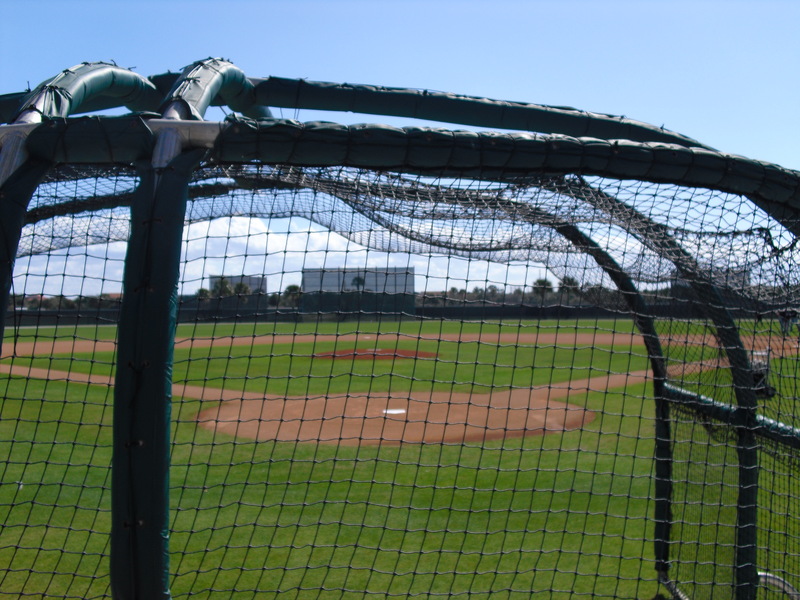 But for February and March, the complex is home to the Major League counterparts of those two clubs–the Marlins and Cardinals. Despite the fact that Jupiter is relatively isolated compared to other training towns in the state, it is a fantastic spring location since it hosts two clubs. As a result, games are played here nearly every day in March. The St. Louis Cardinals are a real masterpiece of a baseball franchise. Founded in 1882, the team draws fans from all over the midwest, captivating young spirits with a storied tradition and a vibrant community. As a result, Jupiter is buzzing with red while Spring Training is in session. Cardinals fans come from far and wide to see their team in action and flood the first base side of Roger Dean to get up close to their favorite studs. On the other hand, the Florida/Miami Marlins hail from just two hours south of Jupiter and draw maybe 10% the number of fans as the Cardinals. They don’t buzz, just murmur. Yet the teal or orange-clad are there to support their Floundering Fish, so for that I give them props. That said, and despite the fact that I’ve only ever mingled on the Marlins side of things, I will try to address how fans of either squad can fully enjoy their trip to Roger Dean. 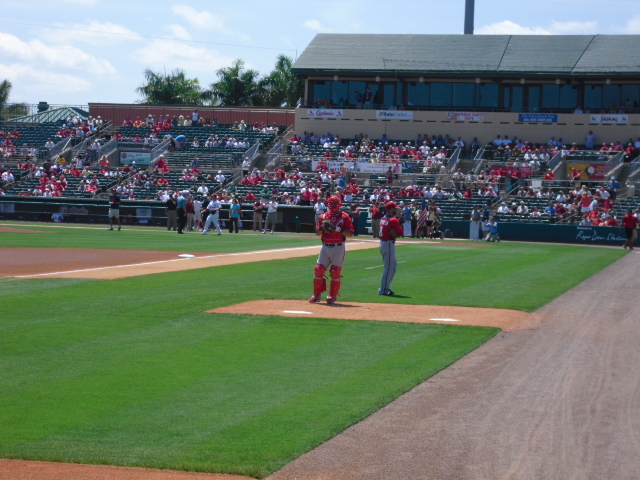 The Marlins occupy the third base side of the field, while the Cardinals operate on the first base side. 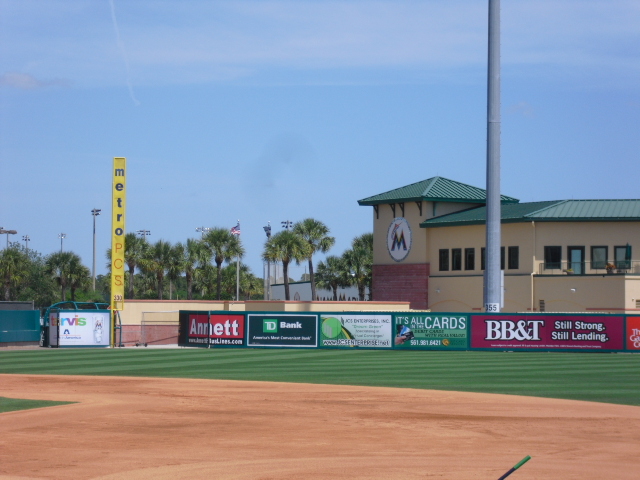 Subsequently, the Marlins practice fields are behind the left portion of the stadium, and the Cardinals are on the right. Tickets to individual games range between $20-$30 for seats in the actual lower bowl. My advice is to not buy these seats unless you can find them at lower prices. Instead, grandstand/bleacher seats along the left field line are cheaper alternatives for decent views. In addition, most games are not sold out, so after the first few innings, it is relatively easy to migrate into the real stadium seats so long as one avoids ushers when necessary. Along the right field line sits a pleasant grass berm, which is great for anyone who wants to sprawl out or run around or do whatever. However, one must have a ticket for the berm in order to be there. Often, Cardinals players will walk in and sign autographs at the berm before proceeding to the dugout. It’s a great spot for signatures, especially since it’s not nearly as crowded as it is down by the dugout. Now, for autograph enthusiasts, the best time and place to be active is in the morning on the practice fields. Most games start around 1 pm, which means from about 8 until noon, all the players are doing drills, scrimmages, and bullpen sessions on the back fields. To access the Marlins facility, there is a sidewalk that runs down the left side of the complex, along the players’ parking lot. A few hundred yards down is a gate, behind which is another sidewalk that leads down towards the fields. The gate is generally unlocked between 9 and 10 am and remains open until game time, so that leaves a few hours to chill out and get up close to your favorite players. From the late innings until after the game, as players begin to file out, hang around the players’ parking lot (directly adjacent to the respective clubhouse outside the stadium). The key in any situation here is to be patient. Also, one is mathematically more likely to have an interaction with a Marlins player than with a Cardinals guy because the player-to-baseball-nerd ratio is much lower. Disclaimer***I have never actually been the Cardinals’ side of the stadium, but I assume that the same is true as far as easy access. The stadium opens an hour and a half before game time, but most players don’t walk into the park before an hour prior. On the Marlins/left field side, the patio between the grandstand and the rest of the stadium extends all the way to the field, which allows fans to camp out right behind the bullpen. Players often stop to interact with fans on the way in, so hang out there, or farther down towards the left field corner if you’re interested in that. As I said above, the berm is the place to be on the St. Louis side of the field since it’s not quite as densely populated and directly adjacent to the gate through which the players arrive. 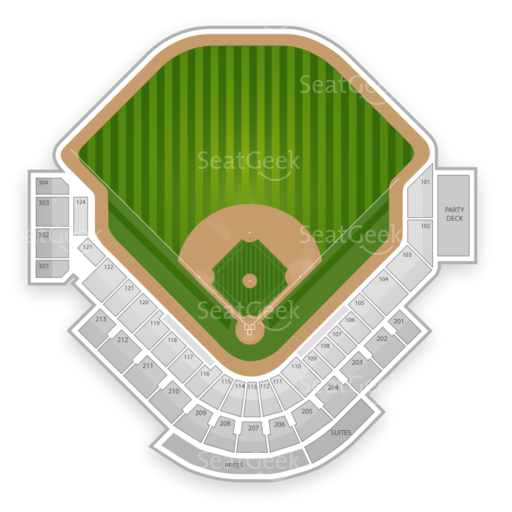 For foul ball enthusiasts, don’t be fooled by the large cross-aisle that runs around the middle of the seating bowl–it is far too proximal to the field to soak up foul balls. Instead, the patio behind the Marlins bullpen in left field is large enough, and generally empty enough to boast the best ball-catching opportunities in the stadium. Also, the players in the bullpen will of course toss souvenirs into the crowd when appropriate. As far as food goes, there’s nothing special. If you want to try something, get a big cup of freshly-squeezed lemonade to stay hydrated. So drink up, lather up the sunscreen, sit back, and relax this spring regardless of your club preferences because baseball is almost here. Stay hopeful, chaps. Thanks for posting this information. It’s very helpful! Next What do you get when you cross a few raccoons with a creative mind?